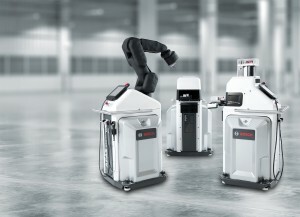 Bosch Australia has expanded into safe robot kinematics with the development of a flexible, connected, safe and collaborative Automated Production Assistant (APAS) solution that enables advanced and adaptable manufacturing for the factories of the future. The mobile production APAS system, which includes sensor skin-protected automation that allows for direct and safe collaboration with people, can be flexibly integrated into manufacturing processes thanks to its standardised operating concept and its interconnectivity. “The mobile assistants have been tried and tested in many Bosch facilities throughout the world. Now they are available in Australia for external customers,” said Andrew Bartlett, General Manager of Manufacturing Solutions at Bosch, in a media release to Australian Manufacturing. The APAS production assistants are designed to collaborate directly with human beings and to provide technical staff with support in performing critical process steps and monotonous and messy jobs. For instance, the APAS inspector features a high-definition camera and an innovative 3D technology which makes it perfectly suited to inspect highly delicate surfaces and perform complete checks. The APAS assistant is also equipped with a six-axis industrial robot arm, a 3D camera system and a sensitive three-finger gripper. As opposed to other robot systems, the gripper arm of the APAS assistant is covered with a highly sensitive sensor skin, which allows it to recognise when a member of staff comes too close, even without direct contact. It then immediately stops its work and waits until the employee has left the danger zone before resuming operation. “This application is unique in the market and enables man and machine to work hand in hand,” Mr Bartlett said. Bosch Australia President Gavin Smith said advanced manufacturing systems such as APAS were the future of Australia’s manufacturing. “Australian manufacturers continue to face ongoing cost and productivity challenges,” Mr Smith said. “The APAS collaborative robot, alongside bespoke production equipment and software by Bosch, gives Australian manufacturers state of the art manufacturing solutions that address these challenges” Gavin Smith said.